BEN: JOHNSON [Gent]. JOHN FLETCHER [Gent]. THO: MIDDLETON. Gent. As it was Acted at the private House in Black-Fryers, with great Applause, by His late MAjESTIES Servants. Printed by the Originall Copy. LONDON, Printed for Humphrey Moseley and are to be Sold at his Shop, at the Sign of the Princes Arms in St. Pauls Church-yard. 1652. 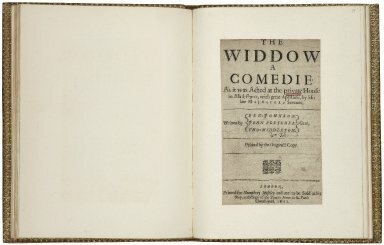 Title page imaged from Folger call number: STC J1015 Copy 2 Bd.w. STC 26145 no.1. Image is not from the transcribed copy.